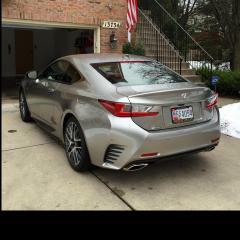 Just bought a 2015 RC 350 Fsport certified pre-owned. We noticed at night, when the lights are on, there is an illuminated section on the drivers side door (about half way down) that runs the length of the door. There is not, though, a similar light on the passenger side door. Does anyone know if only the driver's door is supposed to be illuminated or if the passenger door is out? Uh Oh... My RC 350 has those same low glow door lights on both interior doors. Sounds like your passenger side is not working.